Panama is so much more than the Canal. 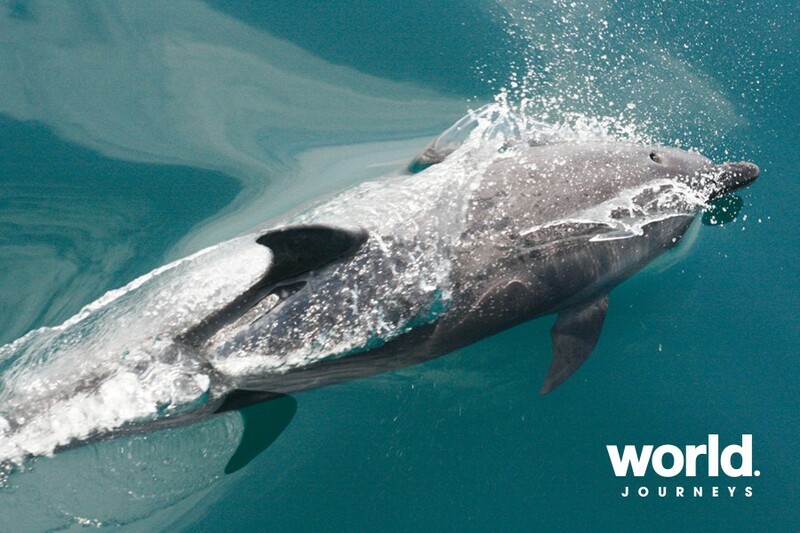 It is a country of incredible diversity of wildlife, cultures and landscape. 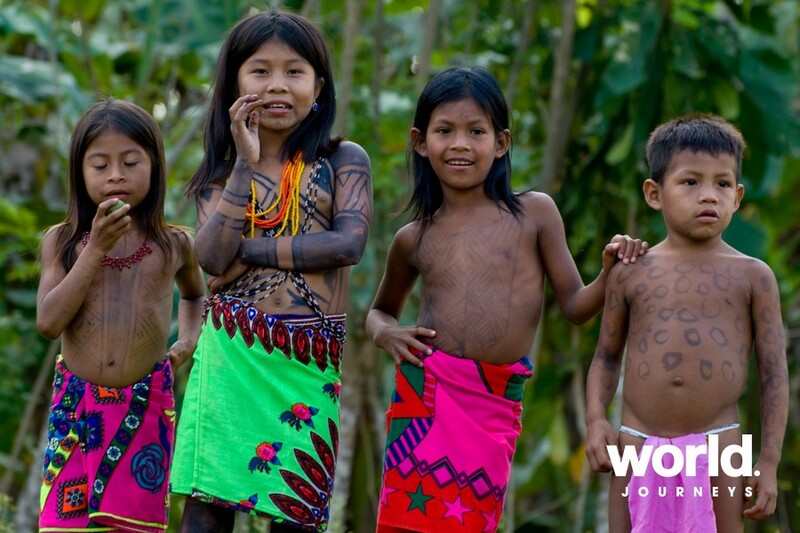 Pass through the locks of the Panama Canal, snorkel in clear warm waters and visit and indigenous tribal group. On board there is great food and very comfortable cabins with private facilities. A past rich in history dating back to the original 'Pirates of the Caribbean' and some amazing experiences await you on this unique seven day discovery of one of the most fascinating countries in the Western Hemisphere. Day 1: Panama City > Flamenco Marina (D) Sail the tropical waters of the Pacific Ocean towards Contadora, where your ship, the Discovery will stay the first night before navigating to the Darien Jungle. Take this opportunity to meet your expedition leaders, the crew and your fellow travelers. Day 2: Darien Jungle (B,L,D) Explore the Darien Jungle and journey into the lives of the Embera Indians. A proud people who have been able to maintain their traditions and lifestyle as they were before the Spaniards colonized the region. These natives are master crafters of cocobolo wood carvings and basketry. As you motor up river keep your eyes open as the region has abundant wildlife that is particularly active along the river's edge. Day 3: Pearl Islands > San Telmo & Mogo Mogo (B,L,D) Snorkel and swim in the waters of the Pearl Islands. The archipelago owes its name to the abundance of pearl oysters which supported a substantial fishery in the early 1900's. On the outer portion of the archipelago, the islands of San Telmo and Mogo Mogo are home to some pristine beaches and fertile fishing grounds. View the remains of the submarine Explorer built in 1865 during the Civil War and that sunk off the coast of San Telmo during the oyster fishery of the late 1800's. Day 4: Panama Canal Daylight Transit (B,L,D) Wake up at the Pacific entrance of the Panama Canal and join the morning's ship convoy for our northbound canal passage traversing Miraflores Locks and Pedro Miguel Locks. The Discovery will be raised 85 feet above sea level to Gatun Lake. You will have a once in a lifetime opportunity to experience up close the history and operation of this engineering marvel. Navigate the Gaillard Cut, the narrowest section of the Panama Canal, bisecting the Continental Divide. This section of the canal is full of history and geological value. 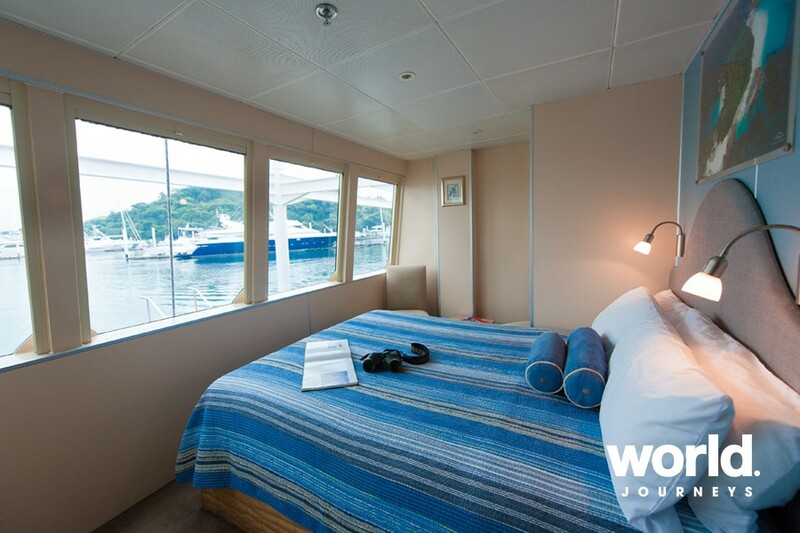 Spend the night in Gatun Lake on Panama Canal waters. 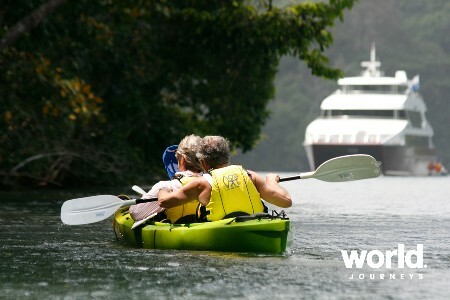 Day 5: Panama Canal > Gatun Lake (B,L,D) Explore Gatun Lake and kayak in Panama Canal waters. Your expedition leader will take you on board zodiacs past lush rainforests to secluded areas of the lake to witness first-hand the splendor and excitement of the jungle. Exotic birds, monkeys, sloths, iguanas, and crocodiles are just a few of the animals that you could see. Cameras are a must as this is considered the world's premier location for viewing monkeys and other animals in the wild. 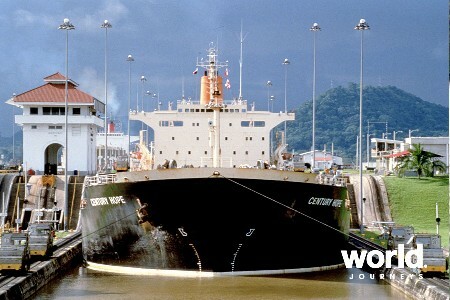 The ship will exit the Panama Canal in the afternoon on its way to the mouth of the Chagres River. Day 6: Chagres River > Fort San Lorenzo (B,L,D) Experience the magnificent Chagres River which was used by the conquistadors to move their gold across the Isthmus of Panama en-route from Peru to Spain and by the gold prospectors who attempted a "short cut" from the US East coast to the gold fields of California. The river was the center piece of the colonial inter-oceanic route and is now the lifeline of the Panama Canal full of wildlife and tropical jungle. 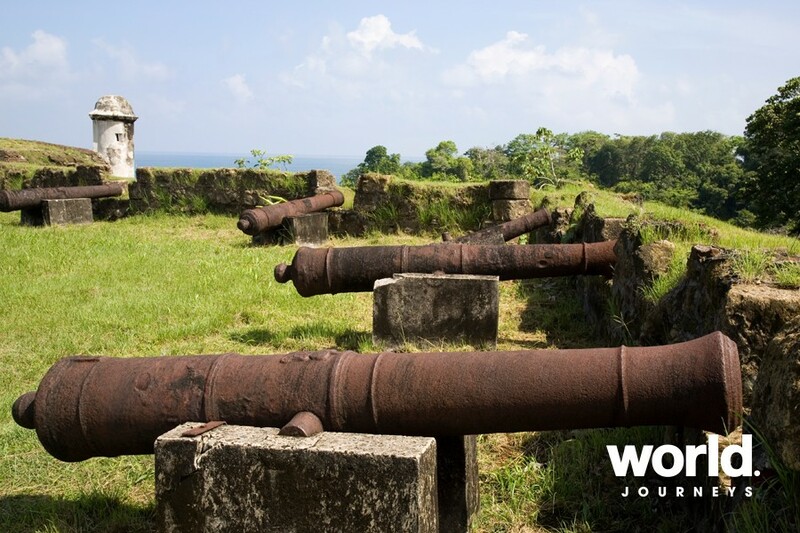 Explore Fort San Lorenzo which is located on a cliff at the mouth of the Chagres on the Atlantic side. Later that evening, the Discovery will reposition to Colon, where it will spend the night before disembarking the next day. Day 7: Portoblo > Caribbean (B,L) Wake up to a farewell breakfast before you disembark the Discovery. Travel to Portobelo, a quaint town rich in history, it was the site of many sea and land battles between the Spanish colonials and the pirates and corsairs raiding the Spanish Main Land. Explore the fortifications built by the Spaniards and visit the Church of San Felipe. Later in the afternoon, board the Panama Canal Railway train back to Panama City. This one hour railroad trip will allow you to traverse the picturesque trans-isthmian route and cruises through the historic Gaillard Cut and glides over slender causeways in Gatun Lake. Day 1: Portobelo > Chagres River (L, D) Start your itinerary aboard the Panama Canal Railway train to Colon City. This one-hour railroad trip will allow you to traverse the picturesque trans-isthmian route and cruises through the historic Gaillard Cut and glides over slender causeways in Gatun Lake. Arrive Colon City and transfer to Portobelo. 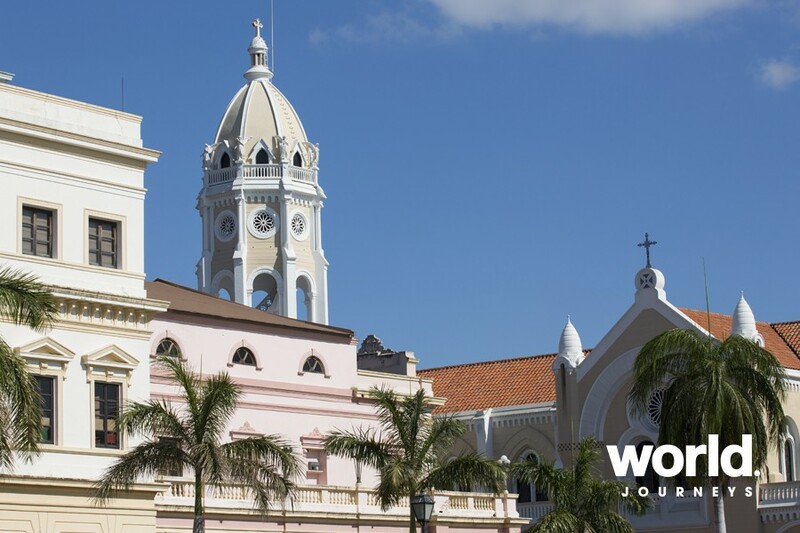 From this quaint town explore the fortifications built by the Spaniards and visit the Church of San Felipe. Around midday board the MV Discovery and set sail towards the Chagres River. Take this opportunity to meet your expedition leaders, the crew and your fellow travelers while you savor our tempting native cuisine. Once you arrive to the Chagres River, you will get off to explore Fort San Lorenzo, which is located on a cliff at the mouth of the Chagres on the Atlantic side. Day 2: Chagres River > Gatun Locks (B, L, D) Experience the magnificent Chagres River which was used by the conquistadors to move their gold across the Isthmus of Panama en-route from Peru to Spain and by the gold prospectors who attempted a "short cut" from the US East coast to the gold fields of California. The river was the centerpiece of the colonial inter-oceanic route and is now the lifeline of the Panama Canal full of wildlife and tropical jungle. In the afternoon you will set sail towards the entrance of the Panama Canal. 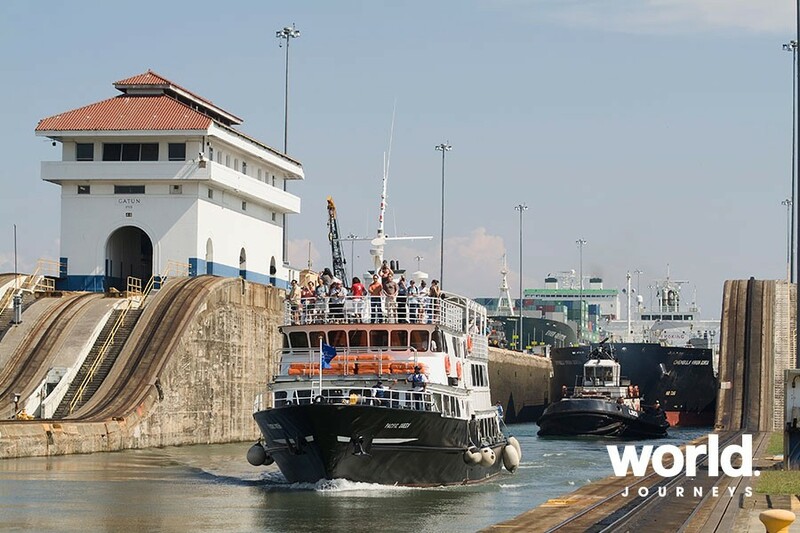 You will start transiting the Gatun Locks, the biggest set of locks, while enjoying the Caribbean sunset. Day 3: Panama Canal > Gatun Lake (B, L, D) Explore Gatun Lake and kayak in Panama Canal waters. Your expedition leader will take you on board zodiacs past lush rainforests to secluded areas of the lake to witness first-hand the splendor and excitement of the jungle. 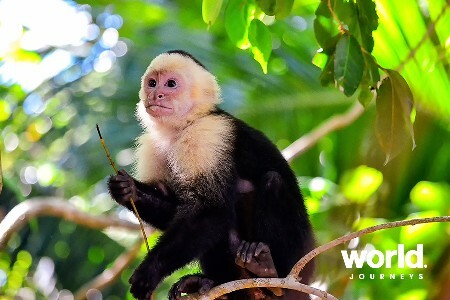 Exotic birds, monkeys, sloths, iguanas, and crocodiles are just a few of the animals that you can see in their native surroundings. Cameras are a must as this is considered the world's premier location for viewing monkeys and other animals in the wild. Day 4: Panama Canal Daylight Transit (B, L, D) Wake up in the middle of the Panama Canal and join the morning's ship convoy for our southbound canal passage. The Discovery will complete its full Panama Canal transit on its way to the Pacific Ocean. Navigate the Gaillard Cut, the narrowest section of the Panama Canal, bisecting the Continental Divide. This section of the canal is full of history and geological value. At Pedro Miguel Locks and Miraflores Locks the Discovery will be lowered 85 feet back to sea level in the Pacific. You will have a once in a lifetime opportunity to experience up close the history and operation of this engineering marvel. Day 5: Darien Jungle (B, L, D) Explore the Darien Jungle and journey into the lives of the Embera Indians. A proud people who have been able to maintain their traditions and lifestyle as they were before the Spaniards colonized the region. These natives are master crafters of cocobolo wood carvings and basketry. As you motor up river keep your eyes open as the region has abundant wildlife that is particularly active along the river's edge. Day 6: Pearl Islands > San Telmo (B, L, D) Snorkel and swim in the waters of the Pearl Islands. The archipelago owes its name to the abundance of pearl oysters which supported a substantial fishery in the early 1900's. On the outer portion of the archipelago, the islands of San Telmo and Galera are home to some pristine beaches and fertile fishing grounds. View the remains of the submarine Explorer built in 1865 during the Civil War and which sunk off the coast of San Telmo during the oyster fishery of the late 1800's. Day 7: Panama City (B) Wake up to a farewell breakfast before you disembark the Discovery. Our motor coach will take you to the hotel of your choice. The Discovery All cabins of the Discovery are outside cabins. They have wall-to-wall windows, private bathrooms with showers, individual air condition. They are equipped with blow-dryer and flashlight. 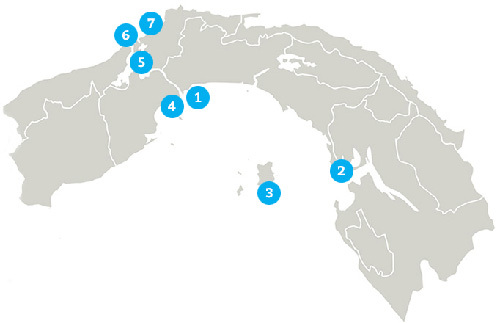 Category 1 cabins are 10.8 square metres and Category 2 cabins are 12.3 square metres. 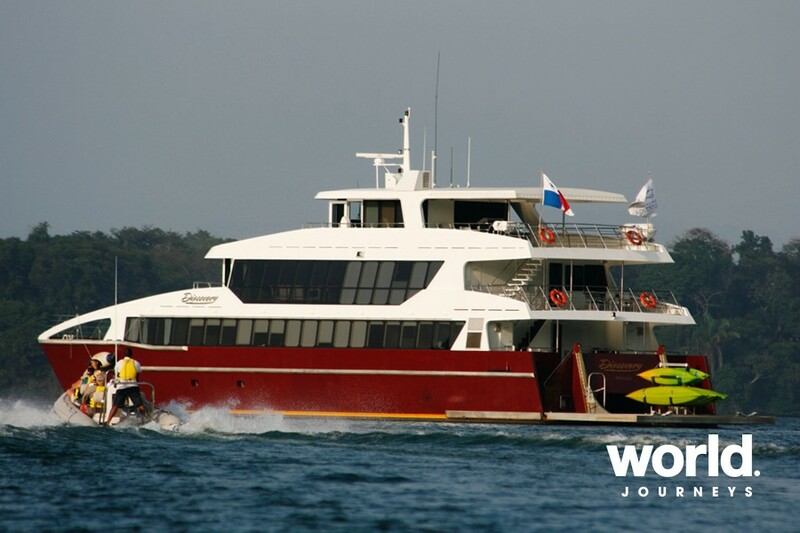 Cruise itineraries are subject to wind, tide and weather conditions and are operated in the sole discretion of Panama Marine Adventures, Inc., in the interests of the safety and welfare of the passengers, vessel, and crew. • 6 nights accommodation • Transfers of passengers to and from the ship. • Transportation, shore excursions, and the use of equipment. • All meals and beverages (alcoholic and non-alcoholic) onboard the ship. • Taxes and port charges. The Discovery Room Categories All cabins of the Discovery are outside cabins. They have wall-to-wall windows, private bathrooms with showers, individual air condition. They are equipped with blow-dryer and flashlight. Category 1 cabins are 10.8 square metres and Category 2 cabins are 12.3 square metres. Save 25% on 28 May & 4 June 2019 sailings! Book the 28 May or 4 June 2019 departure and save 25%. Space is limited so offer is entirely subject to availability.